This week’s Travel Theme from Ailsa’s blog – “Where’s my backpack?” is Sculpture. I like this theme in my travels and find myself photographing sculpture a lot. Probably because I know that it is an art form that I have no chance in being able to produce or replicate (unless it is with Lego bricks, then that is a different story). I do like a combination of human scale sculpture and the large scale sculpture that leaves you in awe of its size. The difficulty in selecting the photographs for this theme was more a choice of which ones to cull rather than include. As usual, all the images in this post link through to the larger photos on my Flickr site (which since starting this blog less than a year a go has had over 5,000 views – makes this amateur photographer feel good). This first shot was taken in Caloundra, which is a beach side town in Queensland, Australia. A lot of these coastal towns look very similar; awesome beach, different buildings, cafes, and surfers. The local council have invested some money in beautifying the boardwalk with sculpture representing water – large pipes, taps, and tubing. This was my favourite shot of the afternoon we spent there with my cousin and her family. In Australia we also have a bizarre affinity (translation – cult like obsession) with big sculptures of things. There is a big prawn, big banana, and from what Wikipedia says another 150 or more big things located around the country. In some respects it is putting country towns, that were traditional rest stops but are now being bypassed by high speed freeway construction, back on the map. This is the “Big Merino” at Goulburn which is about 2 hours drive South of Sydney. We always end up stopping here on the way to Melbourne. BTW it is 15m tall, and requires a compulsory tacky tourist shot (my wife is not in this photo but was in the next). Any trip to France would mean that you have taken at least one shot with a work of sculpture in it. Some are unique in their historical context and others are just beautiful. For my 30th birthday my wife and I went on a road trip to the Champagne wine region. Visiting the cathedral of Notre Dame de Reims is an awe-inspiring experience. This cathedral has the same historical significance as Westminster Abbey in London, but of course the royal line of French Monarchy is no longer around. I don’t know whether this sculpture is still on display inside the church, but I found it beautiful in its colour and simplicity. Also in France but more decadent in its purpose is my favourite sculpture in the gardens of Versailles. The gold leaf glistens under water in this sculpture known as “The Encelade” which represents the mythical fall of the Titans being buried under the rocks of Mount Olympus. It is a stunning piece which took two years to build. Maintaining the French connection, how could one not include the majestic Statue of Liberty across the Atlantic Ocean in New York, USA. This was a gift from one freedom loving nation to another. You can find the original still on the Seine and the riders in this year’s Tour de France may ride past it on the final stage. Still in North America but quite a bit further South in Mexico is a long legacy of sculpture from long disappeared empires. The destruction of the Mayan text and scriptures by the conquering Spaniards now leave a large gap in our historical knowledge of Mayan culture. This small sculpted head was one that took my attention when we visited Chichen Itza. It was one of many located around what is now determined to be the observatory on the site. It was probably the best preserved of all the ones lined up and it is a bit spooky how its gaze looks directly at you. In Japan, sculpture is very different from that in the West. These sculptures have a very deep meaning as they represent family members long passed away. They can be found at shrines all over the country, and the care that is provided them is the of the same reverence that pay towards tombs. Back home in Sydney, I was surprised one day to learn that life-size Lego had descended on Martin Place. I rushed out at lunchtime, camera in hand, to snap the delightful bright colours of the vintage Lego trees and flowers that brought me back to my childhood. You can see I was not the only one. 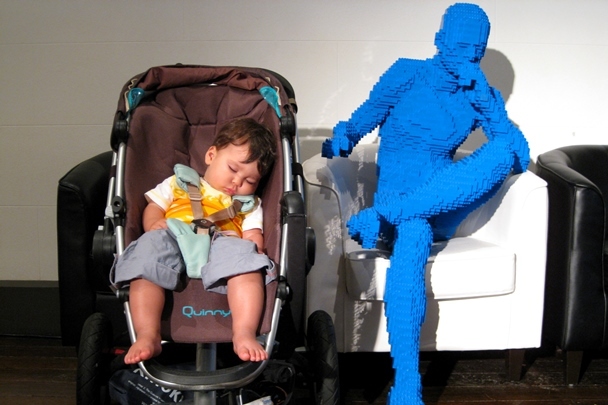 Last but not least, and maintaining the Lego theme, was the opportunity for the Pok (AKA my son) and myself to visit Nathan Sawaya’s “Art of the Brick” when it landed in Sydney. The Pok was quite tired when we first got there, so I had the opportunity to pose him next to a life size Lego man. The freaky thing was when the automatic facial recognition system in the camera started recognising the Lego faces. Freaky! I have posted about sculpture before when I was working in Melbourne, here is a link to my previous post – Melbourne Urban Sculpture. Thanks Ailsa for this week’s travel theme. Please take the time to look at some of the other blogger’s posts – there are some gems.